So I made some pie. Two in fact. Two pies. In one day. For no occasion. There is possibly something wrong with me. I’m also going to give away an apron. It’s really cute. You could win it. Back to the pies though. One is a caramel peanut butter pie inspired entirely by this caramel pudding. The other, is a raspberry rhubarb pie kind of sort of from the lovely Babycakes cookbook. I started the caramel peanut butter pie with a cookie crust. This is probably the easiest crust you’ll ever make. 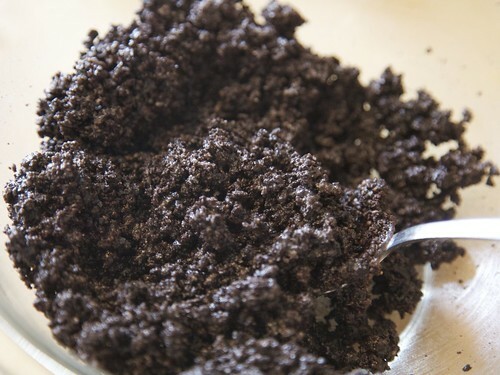 All you have to do is mix 2 cups of cookie crumbs (that’s about 18 sandwich cookies) with 5 Tbsp of melted Earth Balance. 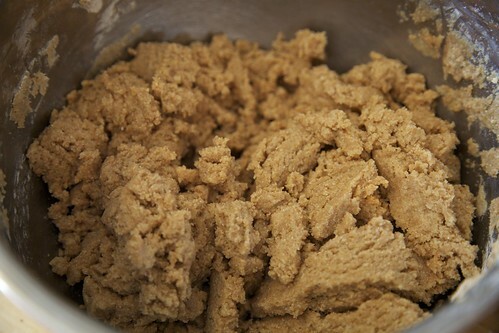 Press this mixture into a greased 9″ pie pan. Put the whole thing in the fridge. Ok, done with that part. Next is the peanut butter. Also, easy as hell. Using an electric mixer, beat together 1/2 cup creamy peanut butter, 1/4 cup powdered sugar and 1 tsp vanilla extract until all combined. Then press this into the prepared cookie crust. It should cover just the bottom. So that bit is a breeze. 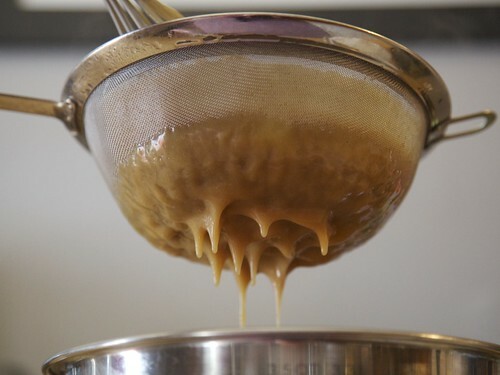 Tell yourself making the caramel pudding will be as well. It will be! Just be patient. When you literally have to watch sugar boil for ten minutes, just imagine the wonderful pie you will have at the end and don’t even think about stirring. Or you can scrub your oven top. That’s what I did. Anyway, yes, just be patient, it will all come together even if it takes awhile. Even if it seems like it’s going wrong. 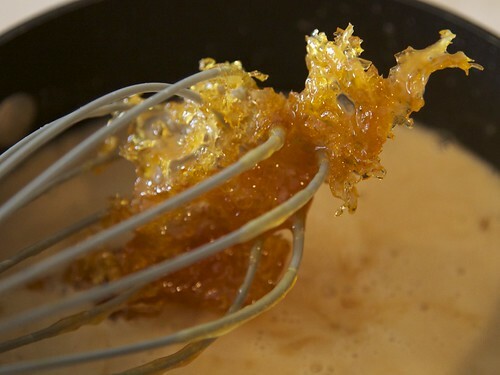 Just be careful not to stab* or burn yourself with the caramelized sugar. But seriously, you’ll be fine. As I mentioned, the caramel pudding recipe can be found here written out for you by the lovely Joy the Baker. To make it vegan, I just subbed the 4 cups of whole milk with 3 cups of mimicreme mixed with 1 cup soy milk. Then, after letting the pudding cool slightly, pour into the pie crust that has been hanging out in the fridge. Let cool completely in the fridge for a few hours (just enough time to make another pie) and you’ll have one decadent and amazing caramel peanut butter pie. See? Looks tasty and oh it is. You may want to put some whipped topping on here, but that’s really your call. Really, this pie is damn good. But don’t forget, there is another pie too. I decided to finally try my hand at an almost gluten free and sugar free recipe from Babycakes. Ok so it’s not exactly the most complicated of low gluten experiments, but it’s a start…next time I’ll go full gluten free, just wait. So the crust is a spelt crust, remember I said it wasn’t entirely gluten free. Now let’s not kid around here, this is some damn good crust. I may have eaten a few pieces before putting it into the oven. I could possibly use this crust always. Possibly. This is the part where I tell you that I didn’t exactly follow the rest of the recipe for the pie. Mainly because where in the hell do you get dried rhubarb? Is this a common ingredient? Who knows. I used frozen. I should have defrosted it. I didn’t. I also used raspberries instead of strawberries. Whatever. Also, when I got to part where you have to roll out the crust, I discovered my rolling pin had gone missing. (Hey mom, did I leave my rolling pin at your house?) That made it a bit difficult to do everything. So my crust was not rolled out as thin as it should have been and other things. It still tasted good. Despite me making some pretty major pie recipe sins this still tasted lovely. I ended up cooking it for about 10 minutes more though, and it was a bit, um, soupy. Like I said, should have thawed the rhubarb. Seriously though, I think I’m about to be a big fan of this agave sweetened business. So there you have it ladies and gentleman, pies for dinner this lovely sunday night. Oh yeah, and the apron. Do you remember back during the holidays I made some aprons for Christmas presents? Well I am a jerk and never gave one to it’s intended recipient. It’s nearly the end of April and it’s just been sitting in my closet. I think it needs a home. I will just give my friend a cooler present next year. Now it can be yours! Think this apron is cute? Just leave a comment on this post telling me your favorite kind of pie and I’ll randomly pick a winner by May 1st. Then you can make pie in a cute apron. *yes I have done this. it hurts. Update: And the winner is…Monica. Congratulations! Apple pie! But seriously, I love all pies. It’s pie! So awesome! That strawberry rhubarb pie looks amazing, and I love the stars in the crust. My favorite pie is probably peach. Hello. Love your blog. My favorite pie today is apple. I know it’s boring. Were you ever a fan of putting a slice of melted cheese on the top of pie? I remember seeing this on the menu at DuPars quite a while ago and I couldn’t wrap my head around it. So weird! Being an October baby, my favorite pie is pumpkin. It doesn’t hurt that it’s so easy to make! Wow your pies look amazing! I would have to say my favorite pie has to do with chocolate and peanut butter. OR depending on my mood, apple. Oh, I’d love an apron! And I love pretty much all pie but I’d have to say that a really good pumpkin might be my favorite. I’d love a goodvegan lemon meringue but haven’t figured that one out yet. Holy crap that peanut butter Carmel pie looks amazing! My favorite is not super innovative but nothing can beat my moms apple pie. It’s the best. Her recipe is a family secret so I felt so honored when she shared it with me. And I recently made it vegan and it was even more to die for. Holy hell, the caramel peanut butter pie looks like it turned out amazing! Favorite pie = Key Lime! Mmmmm pie! 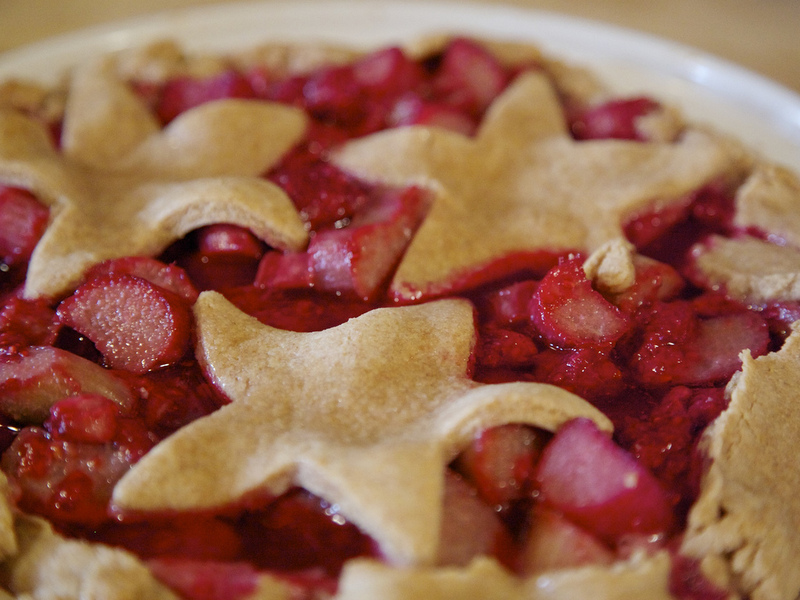 The raspberry rhubarb one looks delicious and cute with the star topping. To be honest, the only pie I’ve ever tried is apple pie. That was before I went vegan! 🙁 I would really love to try a peanut butter pie though, I love anything peanut butter. mmm. Peanut butter or pumpkin pie! How does one choose?? chocolate mousse pie! i love aprons! blackberry pie! the alley behind my parents’ house is covered in blackberry bushes so every fall i make blackberry everything! Warm apple pie, for sure! My favorite pie is my Auntie Jenny’s recipe for apple pie. It has a crumb top with lots of brown sugar and a super flaky crust! We make it instead of cakes on most birthdays too. Gorgeous apron! Yay for pies! The caramel one looks like heaven to me, seriously, I would eat the whole thing myself. The rhubarb one is lovely, but I’ve never actually had rhubarb, before! I need to because that color is just stunning. Great post! Everything on this post looks so amazing I can hardly stand it! Peanut Butter Caramel Pie?! 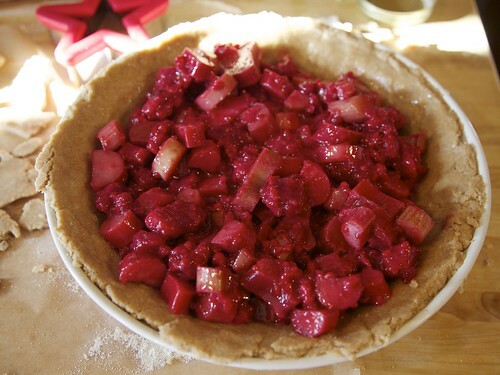 Rhubarb Raspberry Pie?! You are a goddess. I have to try these. As for my favorite pie, I don’t know how to choose. 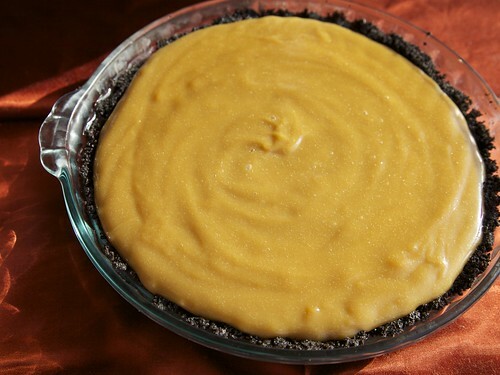 I used to love custard pie more than anything, but it’s kind of hard to make a good vegan version. Cherry pie is awesome, and so is coconut or banana cream. And chocolate pudding, and peanut butter, and cheesecake… I could go on. I wish my bank account was as big as my sweet tooth! My favorite pie is my sweet cherry pie with marzipan. Yum! Those both look so yummy! My favorite pie would probably have to be classic cherry. I also like blackberry cobbler, but I guess that doesn’t really count here. I had some extra pears when I started to make an apple pie, and so I decided to throw them in. Instant fave! Your rolling pin is at my house…..but I would love a fruit pie on Sunday!!! sounds lovely! i’ll have to make it at your house though since the only rolling pin i have is a piece of junk. what sort of fruit pie would you like?